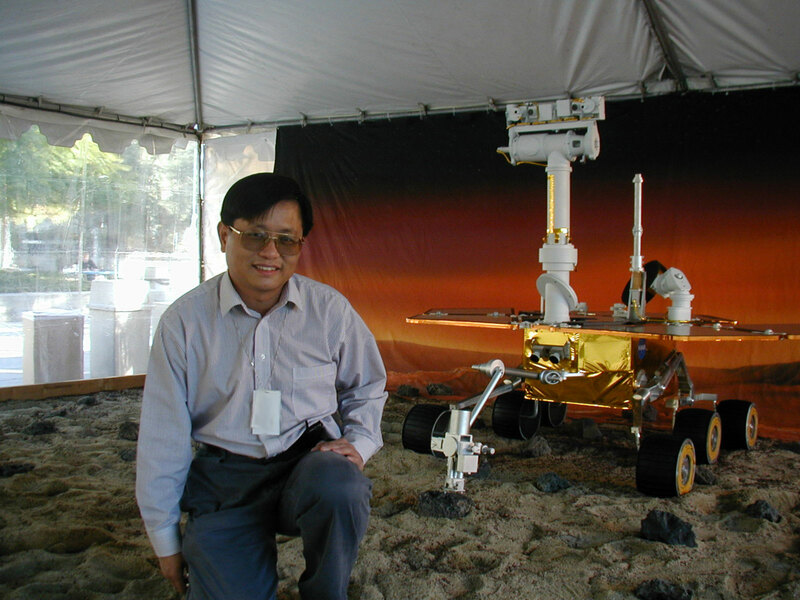 Rongxing Li poses with a NASA rover. A world-renowned Ohio State University (OSU) professor who had access to restricted defense information as part of his work with NASA is under investigation by the FBI for failing to disclose his ongoing connections to Chinese scientists, The Columbus Dispatch has reported. Professor Rongxing Li, 56, unexpectedly resigned from his position in the OSU Department of Civil, Environmental, and Geodetic Engineering in February 2014. Li told OSU that he was going back to China to take care of his sick mother, and no one has heard from him since. A month before resigning, Li submitted a proposal to work with NASA on its Mars 2020 project, which gave Li access to Department of Defense information that he was prohibited from sharing with China. A month after he resigned, homeland security agents searched Li’s wife, Jue Tian, before she boarded a plane to China and found thumb drives containing restricted defense information. Neither she nor her husband has been charged. Li’s research interests include “planetary exploration, digital mapping, spatial data structures, coastal and marine GIS, photogrammetry and remote sensing,” according to his biography on the Planetary Robotics Vision Ground Processing project website. He had worked with NASA previously on missions such as the Mars Exploration Rover and the Lunar Reconnaissance Orbiter. In his Mars 2020 NASA proposal, according to federal search documents reviewed by The Dispatch, Li claimed that he had no ties to China. However, OSU knew he had spent 2012 on sabbatical at Tongji University in Shanghai and subsequently launched an internal investigation into why Li had not notified NASA of his ties to China. The university reportedly discovered that Li not only had ongoing connections with Tongji, but he had also allegedly collaborated on Chinese-government programs aimed at developing advanced technologies. Li reportedly had access to International Traffic in Arms Regulations information with NASA and with Raytheon, a defense contractor. Concerned that he might have provided China with this restricted information, OSU officials notified the FBI, which is now investigating the circumstances surrounding Li’s abrupt resignation and mysterious disappearance.